The strong man dictator of Libya, Muammar Gaddafi, who ruled Libya for 42 years, was killed October 20, when revolutionary forces overwhelmed Sirte, the last major bastion of resistance two months after his regime fell on August 23, 2011 in a civil revolution backed by NATO. Gaddafi had been holed up with the last of his fighters in the furious battle with National Transitional Council revolutionary fighters who had been assaulting the last few buildings the Gaddafi loyalists held in his Mediterranean coastal hometown of Sirte. 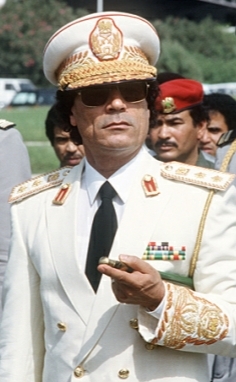 On the morning of October 20, Gaddafi was in a high speed convoy of 75 armored vehicles trying to escape from Sirte. The first NATO airstrike damaged or destroyed eleven of them. Then some 20 vehicles broke away from the convoy moving south. A second NATO airstrike damaged or destroyed half of these. Among the damaged vehicles was the one that contained Gaddafi. Wounded but alive, Gaddafi jumped out of his car and took refuge in a storm drainage pipe where he was captured by the revolutionary forces. The dazed and confused Gaddafi, bleeding heavily from a deep wound on the left side of his head, from his arm, and from other injuries to his neck and torso, was led from the storm drain pipe where he was captured. He was surrounded by revolutionaries with weapons shouting “God is great” and firing in the air, before being put on to a pickup truck which brought him to an ambulance where he was pronounced dead. Gaddafi was an egocentric, erratic, flamboyant, arrogant dictator who held together the diverse Libyan tribal conflicts by force and terror. Libya, under Gaddafi, was the most censored state in the Middle East and North Africa. His regime was denounced as a Pariah state for oppressing internal dissidence and for state sponsored terrorism. He had a dream for Afican unity with himself as the King of kings of Africa. Gaddafi’s regime had the worst human rights record. Gaddafi had no qualms about using his aircraft and soldiers on his own people even before their peaceful protests grew into armed revolution. Political opponents to his oppressive regime were routinely kidnapped, imprisoned, beaten, tortured, and killed.